People are talking a lot these days about guns. Chances are, you have strong opinions one way or the other about whether guns are good or bad and who should have them and who shouldn’t. 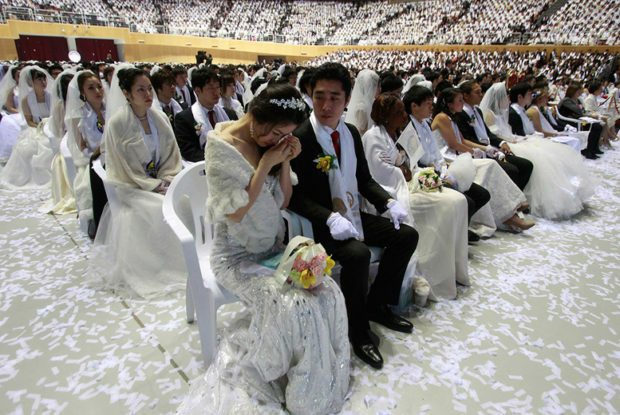 One might say that the Unification Church has a controversial history but that would be somewhat of an understatement. 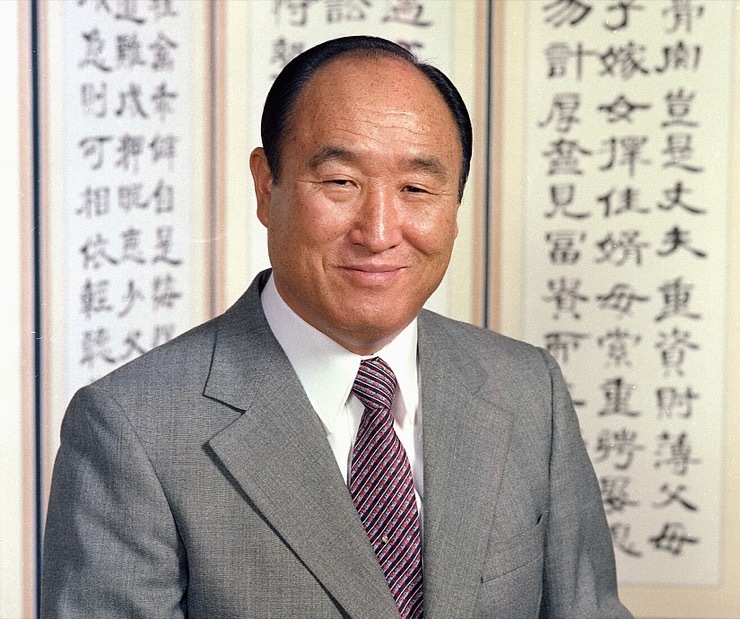 The ostensibly Christian organization is based upon the traditional Bible but also upon “Divine Principle,” a supposedly divine book written by Sun Myung Moon, who founded the Unification Church in 1954. 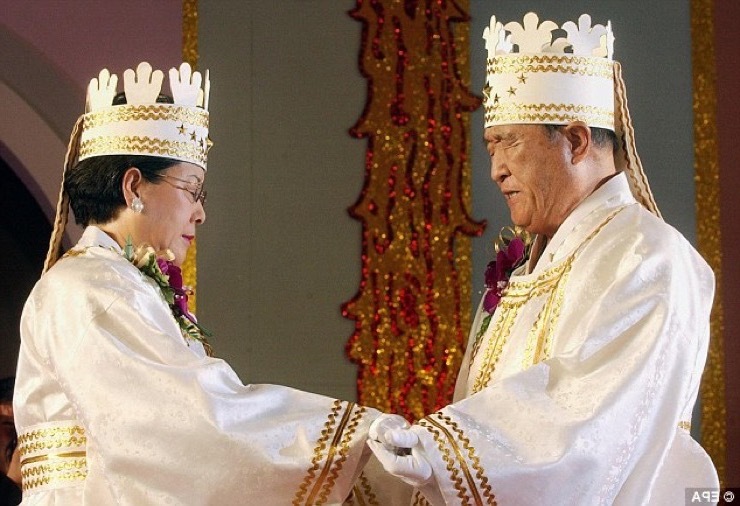 Through the religion he founded, Moon began a multi-billion dollar business conglomerate known as the Tongil Group, using the money that was donated by the Unification Church’s members. 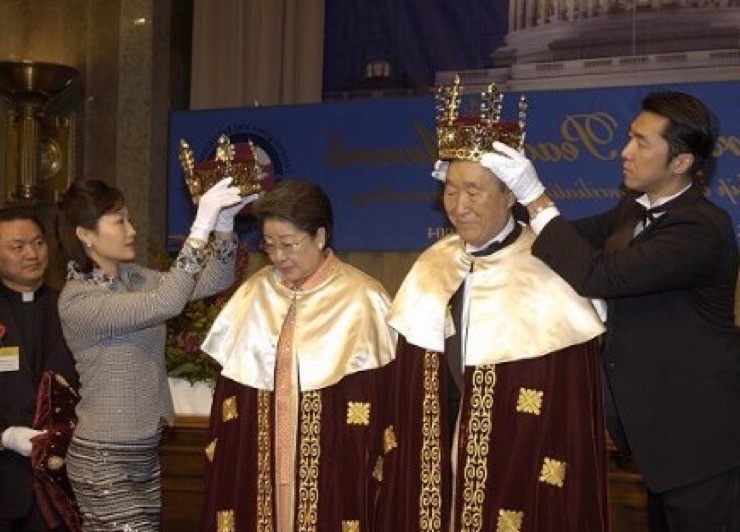 The Tongil Group’s best known property in the US is the Washington Times, a conservative newspaper that was founded by Moon in 1982. 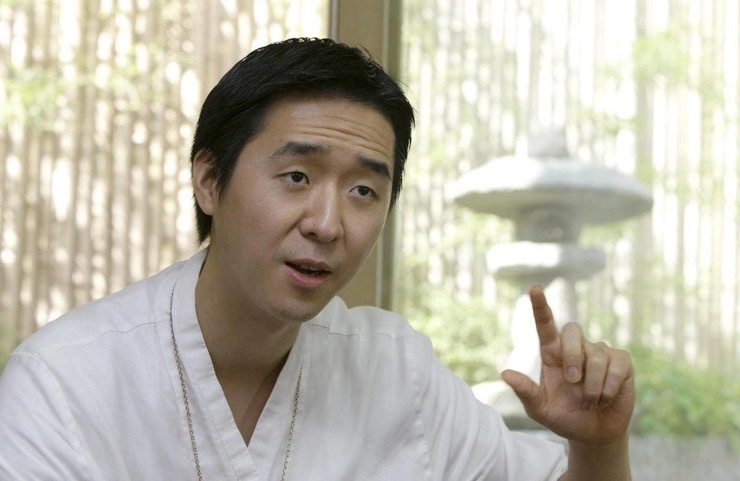 Sean Moon leads the World Peace and Unification Sanctuary, an offshoot of the larger Unification Church. 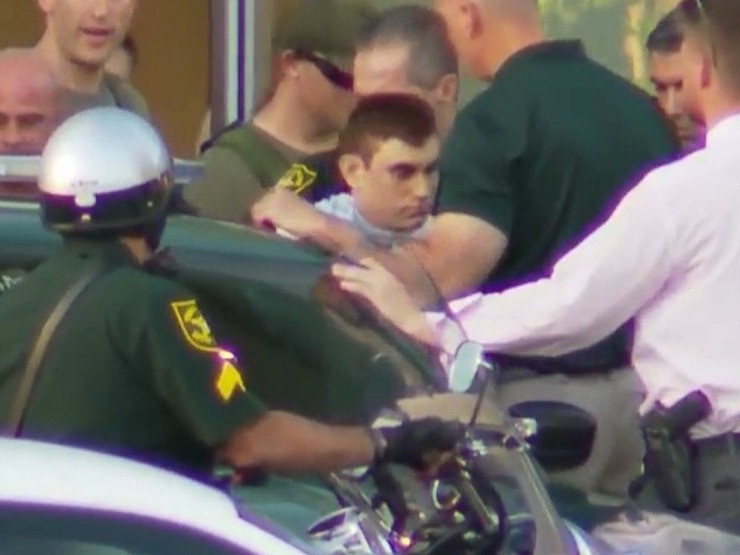 Like his father, he has consistently preached a strongly pro-gun message. 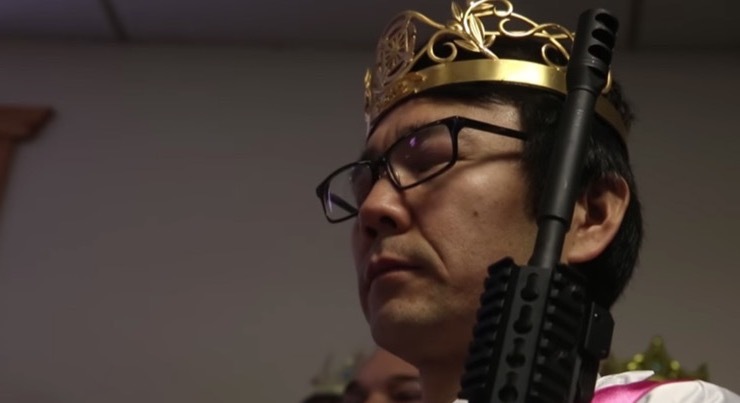 But in the midst of a rash of school and mass shootings, he decided to hold a ceremony that went far beyond what most pro-gun people would consider reasonable. 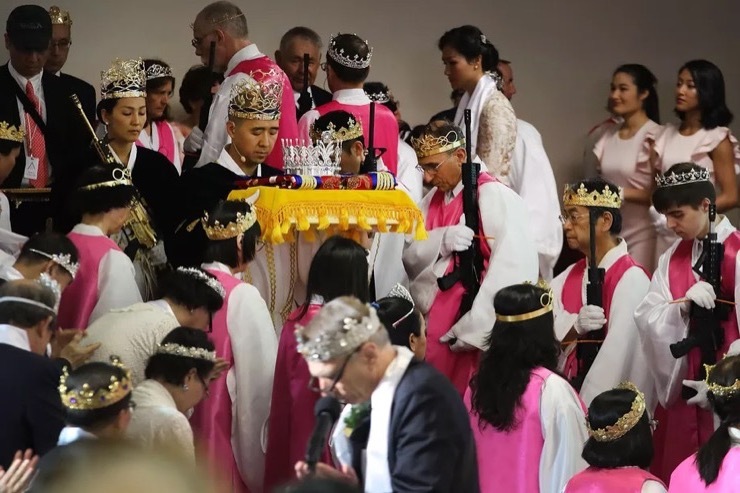 Before the ceremony, the Sanctuary Church asked couples to wear crowns, some made of bullets, and bring “rods of iron” to the ceremony. 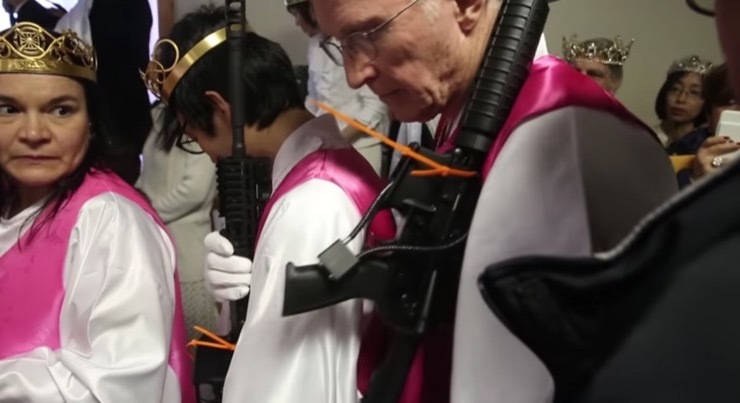 The church refers to semi-automatic rifles as rods of iron, a reference to a passage in the book of Revelations that discussed Jesus Christ “ruling with a rod of iron” in the Bible. 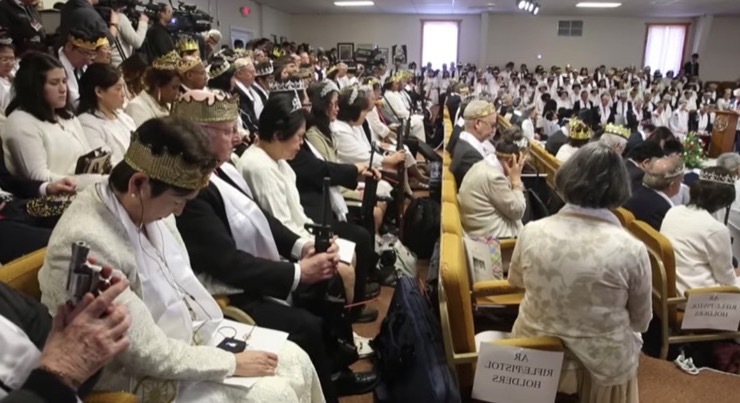 That extra controversy was because the ceremony took place just a couple of weeks after the Stoneman Douglas High School shooting in which 17 people were killed and 14 were injured, all by a gunman using an AR-15. 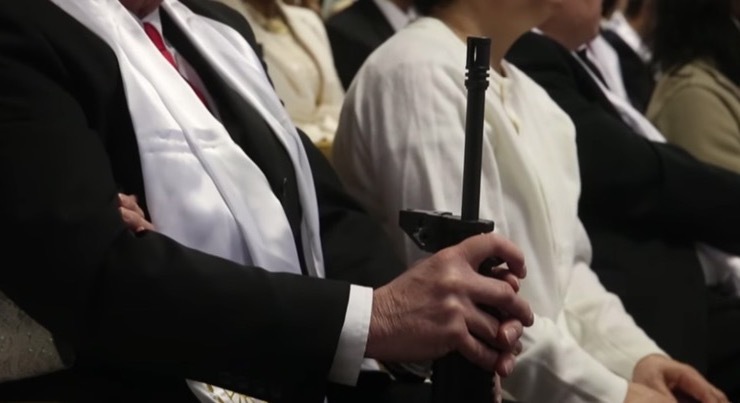 Access to that particular style of firearm was at that point at the forefront of the gun debate. 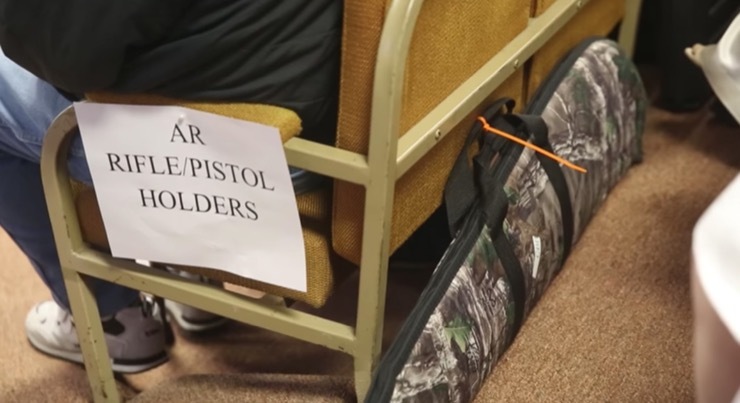 On the one side, people argued that if firearms like the AR-15 – ones that put out a lot of bullets in a short period of time – were harder to get, it would make it more difficult for mass shootings to occur.. 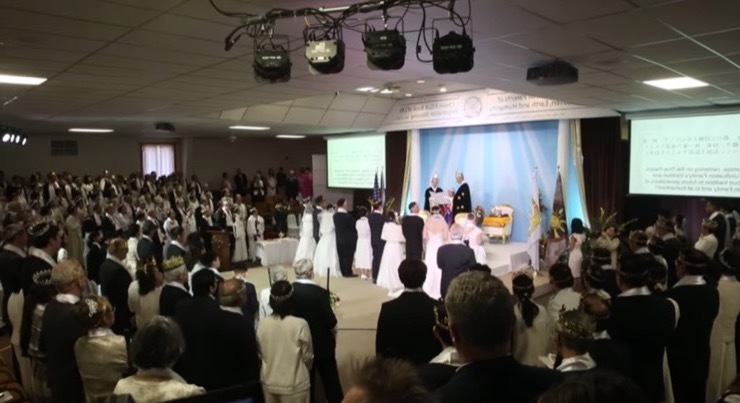 In his sermon at the ceremony, Rev. Moon reaffirmed that belief. 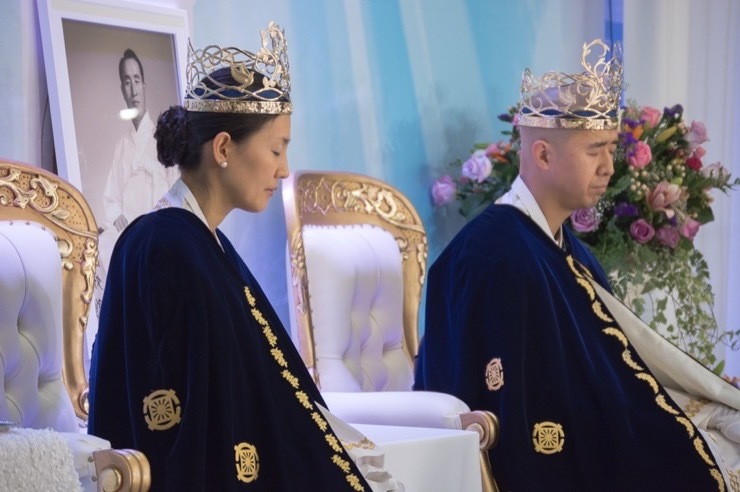 “These actions to participate with crowns and a rod of iron/gift certificate are signs of attendance, sovereignty and vigilance to protect God’s coming nation of Cheon Il Guk”, he said. 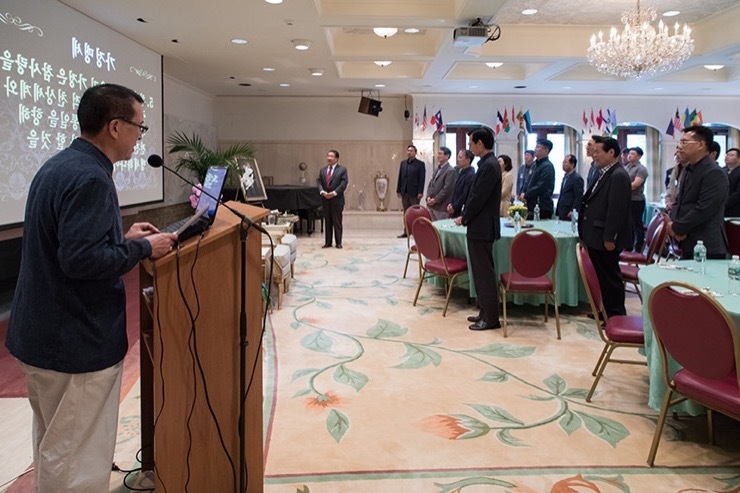 Cheon Il Guk is its name members of the church call the kingdom of God on Earth. 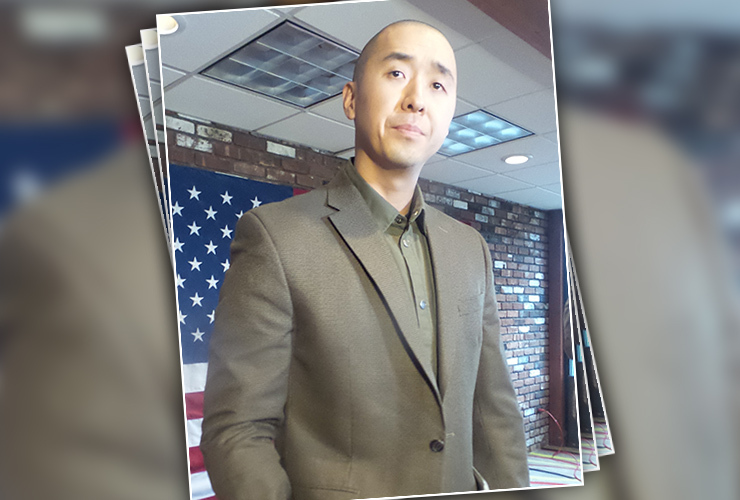 Located about 30 minutes from the church, Kahr Arms had plenty of AR-15s in its inventory for the faithful. 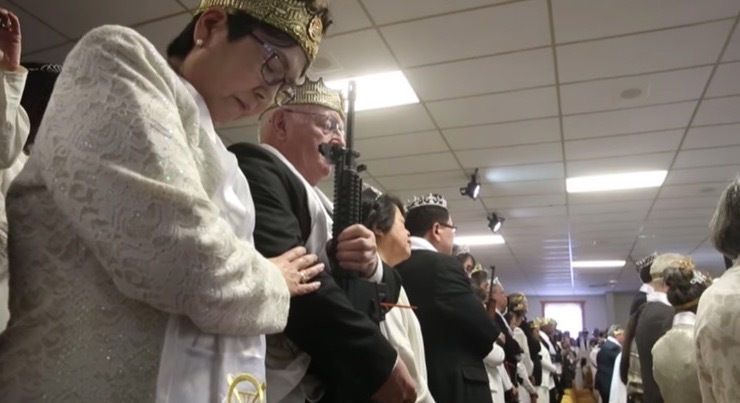 “I actually purchased my weapon there yesterday because, although I have several rifles, I didn’t have an AR-15,” said David Konn, a member of the Unification Church who had driven from Florida earlier in the week. 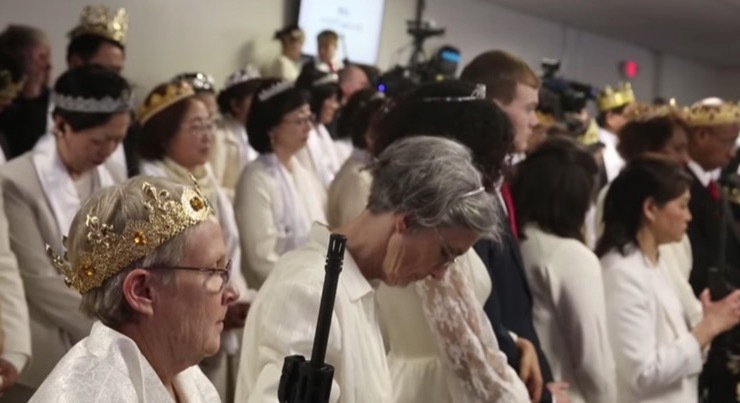 Perhaps the Unification Church’s embracing of guns as a religious weapon and instrument of divine protection says something about the wider gun culture in America. 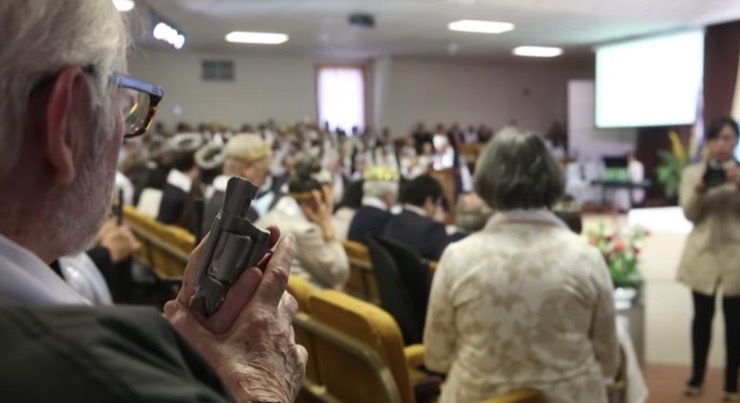 While most gun owners don’t believe their gun ownership is a divine matter, many see it as a moral issue. 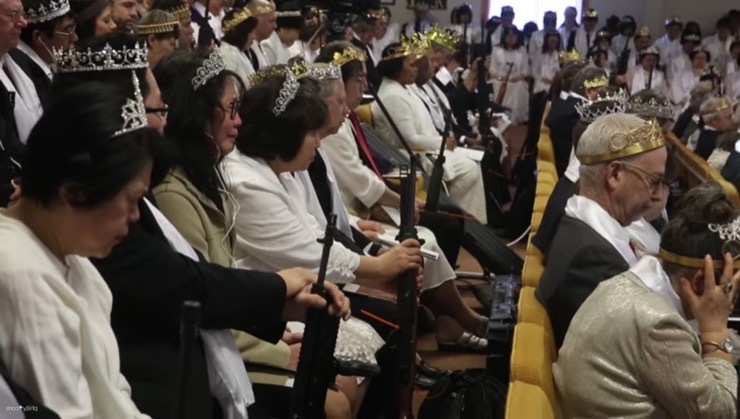 While there is a higher rate of gun ownership amongst evangelical Christians than there is among the general population, the Unification Church is far from representative of the the religious right as a whole. 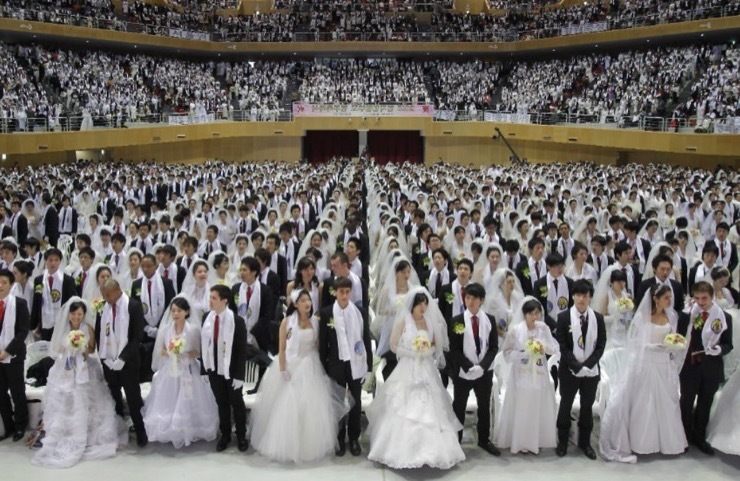 In fact, many religious organizations don’t believe they can be considered Christian at all.